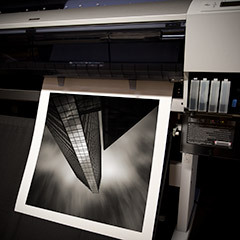 Our studio is primarily focused on providing the best fine art prints available. We have had many requests for matting services and are now 'officially' offering this option. Please note that we are not a full fledged matting and framing facility and simply cannot offer you all the custom options that they can provide, but we do have the knowledge and equipment necessary to beautifully frame your print for you. We stock Crescent RagMat Museum Board and Crescent Select Conservation Board in white, which is suitable for most fine art photographic applications. Please contact us to request a quote for matting services.